Traveling with your children can be incredibly fun and fulfilling. They bring more smiles to your face than anything in the world and they challenge you to have a good time no matter the situation. However, carrying them around, taking care of their needs and trying to find new ways to draw their attention during your travels can be an even bigger challenge. Choosing the right accessories and products for your children can save you a lot of energy and effort. For instance, feeding or playing with your toddlers would not be the same if you wouldn’t have a high chair. But what if you can take it with you anywhere you go and enjoy the same comfort that you have at home? Portable travel high chairs are extremely popular nowadays, due to their functional design, multifunctionality and plenty of other advantages that they offer. Despite of the fact that they do not have long legs, they prove to be very useful in hotels, restaurants, airplanes and practically everywhere. Why buy a portable travel high chair? Portable travel high chairs are useful in a lot of different situations. You can feed your children regardless of the place you find yourself into, you can play with them, teach them, keep them still or let them rest. Although solid booster seats or clamp-on boosters are way more comfortable, travel high chairs have the advantage of being portable, flexible and practical. Therefore, if you enjoy traveling with your family and you’ve got babies, buying a travel toddler’s chair is essential. It is foldable, easy to carry and most of the times, lightweight. Are you looking to buy such a product? Then you are in the right place. We have reviewed 5 of the market’s best-selling portable travel high chairs and we have emphasized their pros and cons in order to help you make your decision. Are you looking for a portable travel toddler’s chair that is portable, easy to fold and lightweight? Then this is the right product for your needs. The Ciao! Baby chair has a simple, minimalistic design that does not require assembly and is quite lightweight at its 8 pounds. Also, it includes a travel bag that helps you carry it easier in airports or from your home to the car. 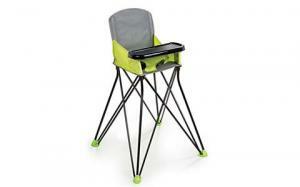 This travel high chair offers a practical solution for when going camping. It is especially suitable for the outdoors because of its design and the little space that it occupies. Its size of 23 x 23 x 32 inches makes it suitable for all spaces, so you don’t have to worry that your child will be left unsupervised, as it will be secured in this chair. What’s to like about the Ciao! baby Portable Travel Highchair? First of all, this travel high chair is inexpensive and suitable in all situations. It can make your life easier by simply allowing you to take your eyes off your child from time to time, giving the fact that they are well-secured. 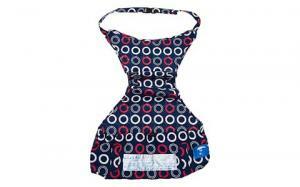 Second, this product comes with a comfortable lap belt that safely holds the child. Last, but not least, the chair meets the ASTM standards, which is exactly what you should be looking for. 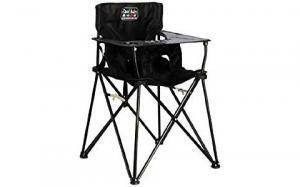 Most consumers, including us, would say that this is more of a camping chair rather than a high chair. However, it is an affordable option if you need a portable chair for your child. If you are in the search for a classier portable high chair and you don’t really like the camping design, this product could fulfill your requirements. It is a lightweight product that comes with a folding frame. You can set it up in a matter of seconds and it is highly portable due to its foldable design. It includes a hard plastic tray that is easy to clean. Also, the entire fabric that the chair is made of is washable. This product is ideal for traveling, giving the fact that it is easy to carry and maneuver, it has rear storage pockets and it comes with a travel bag. if you are worried about the safety of your child while sitting in this high chair, you should know that it has a 3-point safety harness. What’s to like about the Summer Infant Pop N' Sit Portable Highchair? If you are a pretentious person with good tastes, you will love this chair. It is nicely designed and it comes with features that make it comfortable and safe for your children. Also, it is highly portable. Its size of 21.9 x 21.6 x 37.7 inches makes it suitable for 3-month old to 3-year old children, or any child that weighs up to 40 pounds. This high chair’s legs are not adjustable, so you might find it a bit too short, especially if you are a tall person. However, it is great for traveling or for when you want to have lunch in a restaurant. This product is ideal for those of you who are not necessarily looking for a classic high chair, but for a hook-on chair that is practical and can be used anywhere. Basically, this chair is smaller than the usual high chairs for children and can be hooked anywhere that you can find a sturdy table. It is foldable, it comes with a nylon seat and rubber grips. Its light weight of only 7 pounds makes it easy to carry and comfortable to install when traveling, while at a friends’ house or in a restaurant. It measures 25.3 x 14.2 x 14.3 inches, yet after folding, it becomes no more than a ¾ of an inch thick. Thanks to the easily washable nylon seat, this product is also easy to maintain. 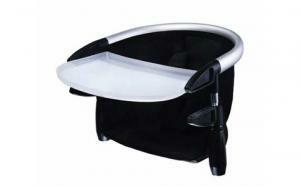 What’s to like about the Chicco Caddy Hook on Chair? From a practical point of view, this hook-on chair is the best option that you have if you are an active person who wants to have their children always with them, but also want to feel comfortable. Chicco is well-known for the high quality of the chairs it produces, so you should not worry about the durability of the frame or the material. The price is one of its main advantages, as it is extremely low, giving the characteristics that it has. Although this is a nicely designed chair that can be carried more easily than the traditional high chairs, it does not have any storage whatsoever, which is a big minus for parents who always like to have baby products, toys or accessories at hand. The fourth product on our list is not exactly a high chair, but a very important accessory for one. This is an incredibly practical and versatile product that is easy to use and highly portable. Basically, it is a high chair cover that will protect your child against all contaminants, such as bacteria or germs that can be found on restaurant chairs, airplane chairs and so on. When owning such a chair harness, you don’t have to look for the suitable high chair anymore. You can simply use those restaurant chairs and bring your own harness that fits all shapes and sizes. It is easy to attach, it is fully washable and can be stored anywhere because of its small size. Also, it can be squashed into your luggage or bag when traveling and it will occupy minimum room. What’s to like about the Totseat Chair Harness: The Original Washable and Squashable, Portable Travel High Chair? The portability of the Totseat chair harness is the main factor that might determine you to buy it. Unlike high chairs, it is small-sized, measuring only 7.1 x 5.2 x 2.8 inches. It weighs 0.26 kg, so you won’t even feel it in your travel bag. More than that, it comes with two options to secure the harness to the chair and it has three adjustable points. Although this product looks perfect, it might be a little too large for very small babies. This last product from our list is one that will catch your eye if you are only interested in edgy, high-quality products. This is a durable high chair that comes in black, with a compact design and extremely durable materials. 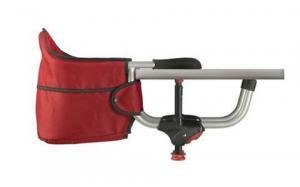 It is made of polyester and an aluminum frame, it has padded back support and includes a shoulder harness system. The Lobster high chair has sturdy clamps that are made of aluminum, as well as non-slip pads that are suitable for both indoor and outdoor use. Thanks to its design, this chair can fit in children between 3 months and 3 years old. The great thing about it is that it is equipped with an aluminum tray that is safe to wash in the washing machine. Also, it comes with a travel bag where you can also carry diapers and other accessories. What’s to like about Phil & Teds Lobster Highchair, Black? This high chair is comfortable for children thanks to the padded back support. Also, it is comfortable to carry for the parents thanks to its size of 12.2 x 13.4 x 12.2 inches and its weight of only 3.8 pounds. The illustrated tray is also a big plus, as it is easy to transport and clean. Moreover, the good claw grip represents an advantage. This product cannot be attached to unstable tables or other surface types. Also, it is recommended not to be used with round tables. Some consumers also complain about the fact that the seat is soft, instead of being firm. How does a travel high chair encourage participation in social activities for your child? High chairs are probably some of the smartest inventions for babies, as they allow you to feed them without slouching to reach to their level, increases their comfort and at the same time, makes feeding more fun. Besides that, it is crucial to understand the importance of their participation to the adults’ table from time to time, if not always. A high chair that you keep at home at all times allows your baby to form a feeding routine, understand that everyone eats at certain hours and that he or she has a place at the table. Fixed high chairs for babies and toddlers are practical, but it is really difficult to take them with you whenever you leave the house. Travel high chairs are attractive for one basic reason: they are portable. They come with a foldable design, are easy to transport in your trunk and even easier to carry around. Imagine that you are invited to a friend’s birthday party at a restaurant and you have no one to leave your child with at home. If you own a portable high chair, you can simply pack everything up quickly, prepare the car and go. Your child gets to participate, it won’t feel excluded and will learn how to behave among friends from an early age. Also, you won’t have to worry about the feeding schedule, as you can do that anywhere, as long as you have the baby food with you. Are high chairs comfortable for babies? This is the interesting part. If, in the past, high chairs were made out of plain wood and seemed very uncomfortable, things have changed nowadays. Manufacturers built these chairs with comfort in mind, adding durable materials, padding, arm rests and even a head rest. Some models come with a removable table tray and some with a fixed one. The great thing about modern high chairs is not only their design, but also their adjustability. Of course, if you choose to buy a camping high chair, chances are that such a model will not be as adjustable as you need it to be. However, if you choose to go for a more advanced model, it will exceed your expectations. Is a portable high chair as comfortable and durable as a fixed one? It is a popular opinion that everything portable is less comfortable than fixed products. The truth is that this kind of mentality is growing old. Portable furniture is functional, built of durable materials and made to last. More than that, travel high chairs usually have an ergonomic shape, they are easy to adjust and sometimes come with padding and everything that a child might need to feel comfortable. Besides comfort, these chairs are also safe. Due to the fact that they are portable, and manufacturers know that parents will be using them in all sorts of places and surfaces, they are stable and come with plenty of safety features. For instance, the 5-point harness system is a feature that almost all products have. Adjustable and removable foot rests, cup holders, removable table trays are just a few of the accessories that high chairs can include. Finding a good high chair that is portable, easy to transport and comfortable for your child is not an easy task, but it is not impossible, either. It is, however, important to find a product that suits your needs, as you will be using it for years to come, especially if you are planning to have a big family. Durability, flexibility, portability and adjustability are four of the most important features of a travel high chair. If the product that you choose fulfills all of your requirements, including the mentioned ones, you have found the perfect chair for your child. By using a portable high chair, you will be making your life easier and will be able to have a stress-free daily routine, as your child will be safe and secure in its chairs while you will be doing your other tasks. At the same time, you will be offering them the possibility of discovering new things while sitting in their own chair, rather than in your arms or someone else’s.